Yesterday was another lovely day full of shopping. I really am a shopaholic even though I hate parting with my money. I just love the thrill of shopping even if I don't buy anything. It makes me so happy seeing all the pretty clothes and shoes. But even more than shopping I LOVE a good deal, as you have all probably noticed by now. (Today I did not enjoy shopping, you'll see why later). I'm going to try to sell the 2 things I wanted to return (I don't need the dress and the skirt is too small). Shipping will be $5 in the US and $14 international (sorry :/). Even if you get both it is the same because they'll both fit in the same box. 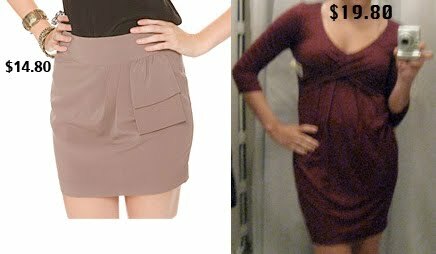 The dress is $19.80, size M (looks bad in the photo) & the skirt is $14.80, size S. If you're interested, comment here and leave your email or email me. Nice!!!! Wanna follow each other? it's a dumb policy if merchandise is clearly current, new, and unworn but is it a CLEARLY STATED policy? That stuff is usually told when you purchase things and on the receipt that you lost. if they have said that they don't accept returns without a receipt you can't be too mad at them for doing something that they said they would anyway. Cute skirt, I really love the colour! That's the only bad thing I have to say about F21- is there return and credit policy. They NEVER return or give you credit even with the tags on. Great post! And thanks for voting for me. Sounds lovely! I desperately need a shopping day, but unfortunately I have to wait. I'm sorry about your Forever 21 experience, but I am pretty sure their policy is that you have to have the receipt. Yeah, stores need to learn that a Nordstrom customer service experience works much better. Aw sorry you had a bad experience :( That is never fun! Hope the rest of your weekend was better. I tried to return something to F21 once and they wouldnt let me. It was a lonnnnnng time before I bought anything again. Aww, there's still stores that exist in the caveman era? I do like these pieces and I think they'd look good on you! Hope you get to sell it soon! those are some great pieces, what a shame! i wish i could add them both to my wardrobe but i'm never certain if things will fit! I love the skirt. What size is it? No matter the return policy or the store, I always try things on before buying. If I don't absolutely love the fit, I tend to wait before going back to buy it. It seems like a lot of stores are no longer accepting returns or have a complicated store credit policy. One of my friends recently got married and had a Target wedding registry. She got a few of the same items (ie toaster, bedding etc) since not everyone used the registry. When she tried to return items, Target would only give her gift cards for the item and the gift card had to be used in the department the item came from! So, she could only buy kitchen items with her gift card, even though her kitchen was all set! They give you a hard time if you want to return, but not so much if you exchange... Not that I'm encouraging you to go back in F21 if you're very upset (I boycotted Macy's for a couple years due to a similar experience) but if you find something else you like in the store you could just ask for a swap. I've never had a problem doing that, even without the receipt. I'm a follower of your blog and hope you'll add me as a follower as well! Check out my blog too! I'm a follower of yours so maybe we can swap? Thanks if you do! The reason stores need a receipt for a return policy darling is that you could have bought the items somewhere else thus meaning their company would be at a loss if they gave you a credit note without proof of purchase. For example you could have bought those items off ebay new with tags for half the price. Give them a credit card statement as proof of purchase if you paid by card.